I realized something this week. At 5 months pregnant, I have the same reaction when I open my closet as when I open my fridge. There’s stuff in there, but nothing looks like it’ll work quite right. It’s a little sad. Maternity clothes just don’t quite fit right yet, and my existing wardrobe is pretty much over for at least the next 4 months. And I’m way too frugal to run out and buy tons of clothes that will only fit for a few weeks, maybe a month. I’ll make do with what I have from the purchases I have made and the hand-me-downs my sisters have given me. When it comes to the fridge, I struggle to plan out food that I will actually feel like eating days later. Baby’s cravings are not so predictable. (Except for scones. Baby always likes scones.) My frugal nature again prevents me from buying lots of fresh produce that I might get sick of or not feel like eating 2 days later, especially when the husband is out of town for work. So what to do? I’m trying to come up with options that can be prepared quickly from staples that I keep around all the time in the cupboards and the freezer. Sometimes that’s frozen pizza, and sometimes that’s polenta, evidently. I was watching the end of an old episode of Iron Chef America. The secret ingredient for the battle was corn and one of the chefs made polenta. I was instantly inspired. A quick Google search on the phone brought up a basic recipe from thekitchn.com. I pulled out a small bag of frozen sweet corn from the freezer, added half an onion, and a can of black beans for the protein this mama needs, and decided this would be a tasty dinner. I was pretty much right. And leftover polenta is delicious cut into “fries”, fried in butter, and seasoned with salt and pepper. Mmmm…. now I want more polenta. Just as a warning, I’m spoiled rotten when it comes to sweet corn. This corn was harvested on my parents’ farm and cooked and processed the same day it was cooked by yours truly and the rest of the family. It is soooo good. So if you’re trying this out, maybe go to your local farmers’ market and buy some fresh sweet corn to use here to experience what I experienced. 1. Bring water to a boil in a large saucepan. Once it’s ready, add the salt and remove from heat while you gently stream in the cornmeal and whisk it in. Return to your hot burner, but reduce the heat to a simmer. Let the mixture cook for 30 minutes, stopping to stir it every 10 minutes. 2. While the polenta cooks, heat the olive oil in a skillet. 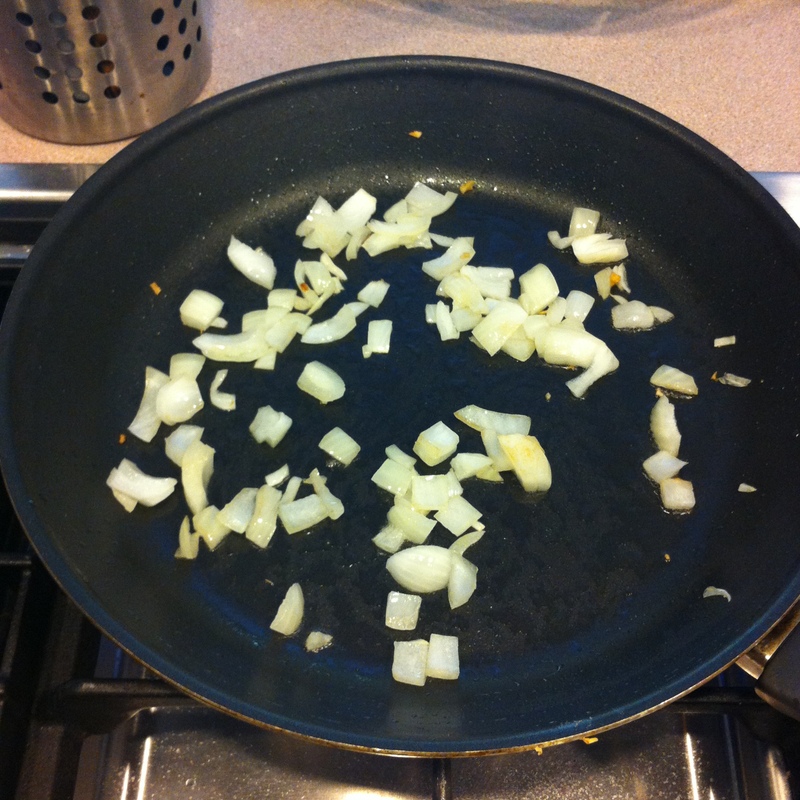 Add the diced onion and saute for 5-7 minutes. 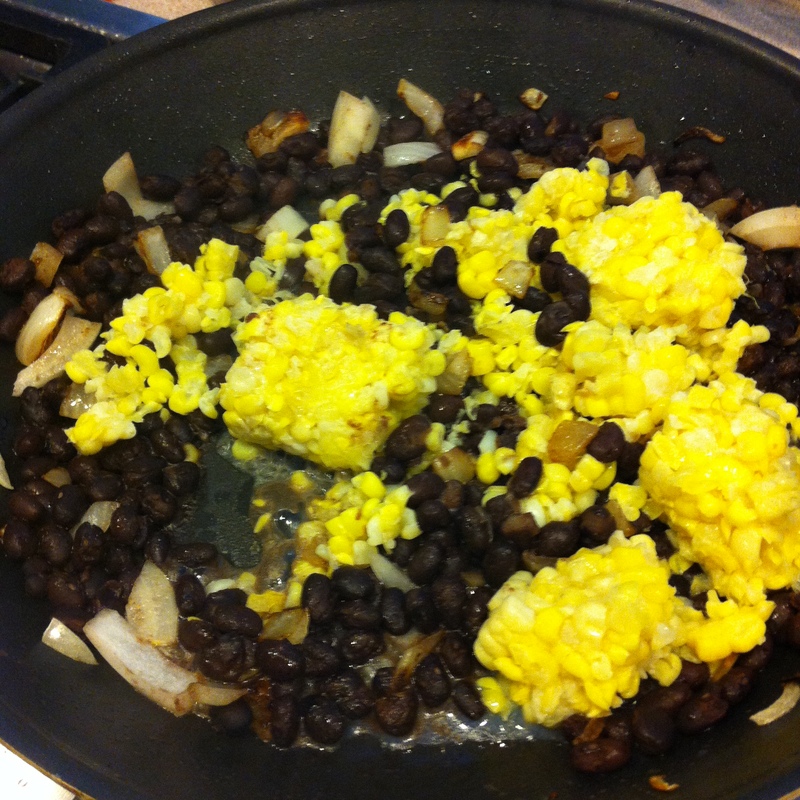 Add the black beans, frozen corn, and seasonings and stir. Play with the seasonings to suit your tastes. This pregnant mama shies away from intense spices these days, so you may want something with a little more heat. I imagine a jalapeno would fit nicely in here. 3. Once the bean and corn mixture is hot, reduce the heat and let it sit, stirring occasionally, until the polenta is done. 4. 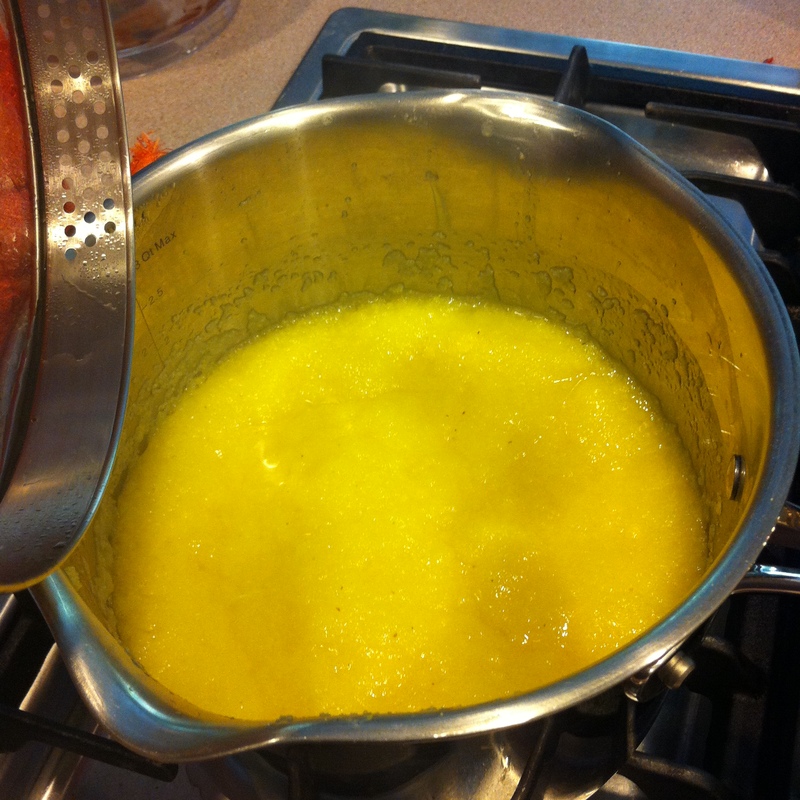 After the polenta has finished cooking, stir in the butter and cheese until it has all melted. 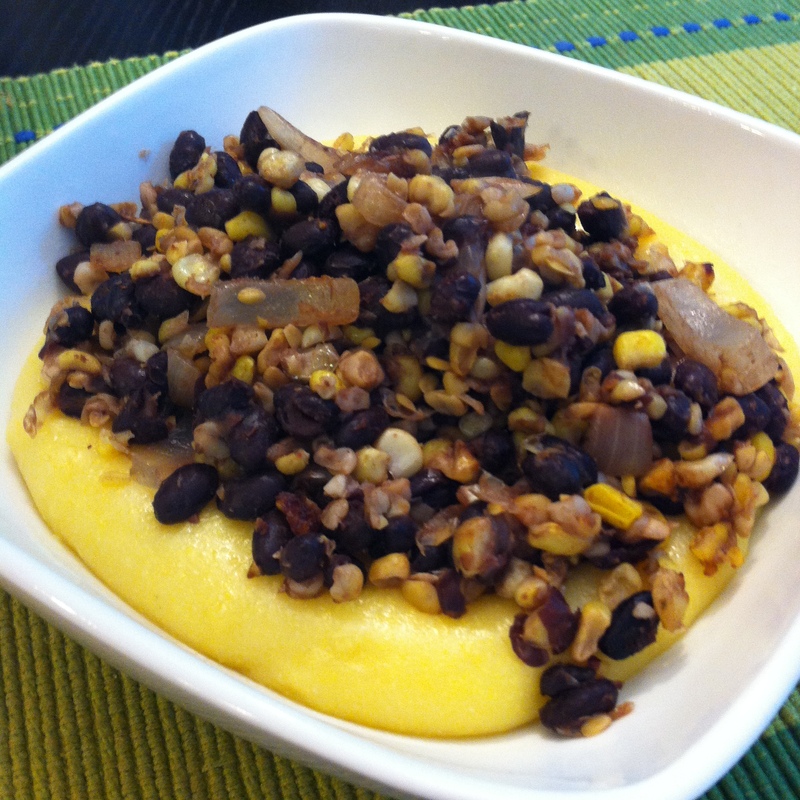 Serve the bean and corn mixture over a cup of creamy polenta. Salt and pepper to taste. And here is my sole roommate for the week while the husband’s gone. 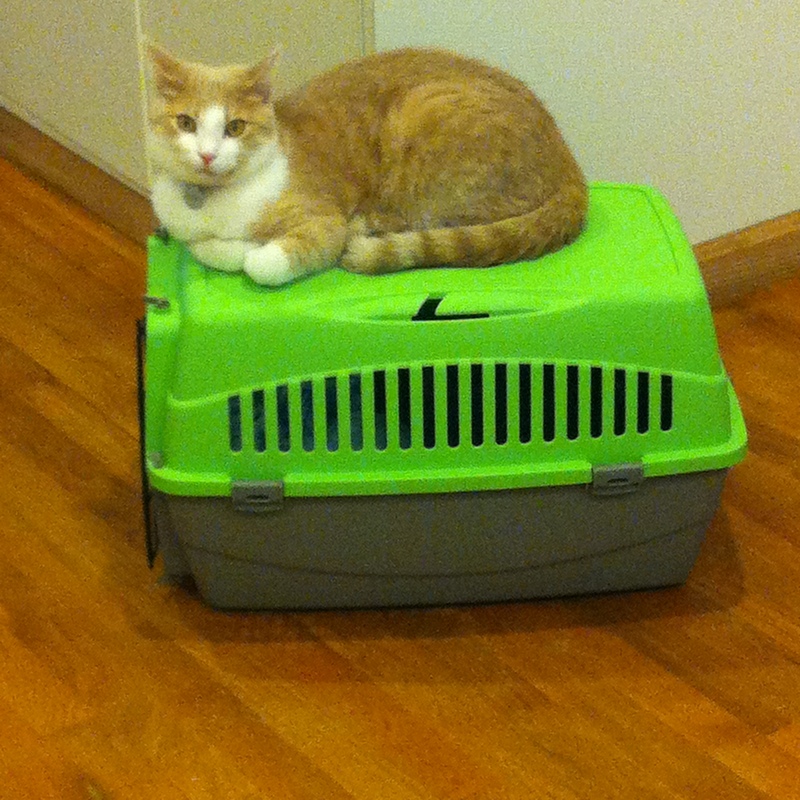 Here he is conquering the carrier that took him to the vet to give him a shot of antibiotics. He took it like a champ and he seems to be feeling better already!